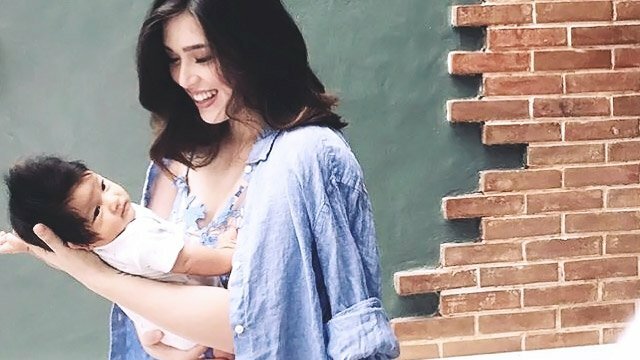 "Ayoko lang yung napilit kami para lang ma-please 'yung mga tao," says Kylie. The former Encantadia actress confirmed that her father, Robin Padilla, has neither seen her son Alas Joaquin in person, nor has he spoken to her fiance, Aljur Abrenica. When Kylie was still pregnant, they tried visiting her dad at his home to talk, but that was also unsuccessful. "Bilang anak niya, naintindihan ko yun, kasi alam ko yung gusto ni Papa. Gusto niya ikasal muna kami, that’s all, " Kylie told Pep.ph. The new mom admitted she was hurt then, but respected her father's wishes. Now that her baby is born, Kylie said the situation with her dad hurts even more, but admits it's also partly her fault, not just Aljur's. She stressed, however, that she and Robin are constantly in communication; her dad was present during her four-day labor. "Hindi naman siya tumigil sa kaka-reach out. Palagi naman niya ako kinakamusta kahit hindi pa lumalabas si Alas. 'Kamusta, anak? Nahirapan ka ba? Kumakain ka ba?' Ganyan," she shared. Kylie stressed that her father is right in that marriage should come first; it's just that she chose to prioritize her son right now. "It’s just that napaaga 'yung nagka-baby ako, hindi pa kami kasal. Medyo siyempre marami ang masama pa yung loob sa nangyari," Kylie said. While it hurts that his dad's stance has not softened even after Alas was born, the new mom was firm to say that she and Ajur are on the same page and that they don't want to rush into marriage. Kylie came from a broken family, and she knows what a marriage entails. "Naintindihan namin na may baby kami. Kahit may baby kami, may mga inaayos pa rin kami, 'di ba? So, 'yung kasal, hindi pa sa ngayon talaga. At ayoko lang yung napilit kami para lang ma-please 'yung mga tao or, I’m sorry, para maging okay si Papa. Pero kaya kong tiisin 'yun. Kasi alam ko sa sarili ko na hindi pa kami handa, hindi pa talaga," Kylie said.